For the first time in years I’m without a car over winter, which means the GTR is my sole form of transport no matter how cold it gets. Having covered 10,000 miles on the GTR since it arrived in early April I reckon it could be a great bike to battle winter – but that’s not to say it’s perfect. I’ve previously described it as a little boring, but the motor is the strongest asset the GTR has. Not only is it deceptively fast, but, more importantly on greasy roads, it’s incredibly smooth and predictable. It inspired incredible confidence in poor conditions. The GTR has traction control, but no matter how much I’ve abused the throttle it’s only ever kicked in on loose surfaces. The electronically-adjustable screen is excellent at keeping the weather at bay. I’ve got it set in its tallest position, which keeps off most of the wind and rain, and also blocks out a significant amount of wind noise. It’s not just the screen either, the size and placement of the mirrors mean they keep a lot of the weather off my hands while the fairing almost completely covers my legs. Kawasaki make a pair of wind deflectors (£86.95), which attach near the mirrors to increase protection, so I might give them a go. How did I ever get through winter without heated grips? The heated grips on the Kawasaki have been on for quite a while now, keeping my hands toasty no matter the temperature. They don’t get so hot they burn, and seem to fall perfectly into the ‘comfortably warm’ range. The dial provides plenty of temperature adjustment. It’s just a shame you have to take a hand off to adjust them and the dial isn’t lit, so it’s difficult to find in the dark. If it gets really cold, I can plug heated kit into the 12V socket on the dash. Toasty. Riding every day on salty roads can kill a chain. Luckily the GTR has shaft-drive, which as well as helping keep throttle response lovely and smooth, means one less thing to keep on top of. I’ve struggled to get used to the linked brakes all year, mostly when just using the back brake – apply a little much and the front brake chimes in unexpectedly. This isn’t generally much of a problem, but could have consequences when using the back brake on slippy, cold surfaces over winter. This is an odd one, but the GTR is incredibly sensitive to changes in pressure. Just one PSI at either end is enough to make a noticeable difference. Now the days are getting colder, the handling is always a little off until the tyre pressures increase with heat. 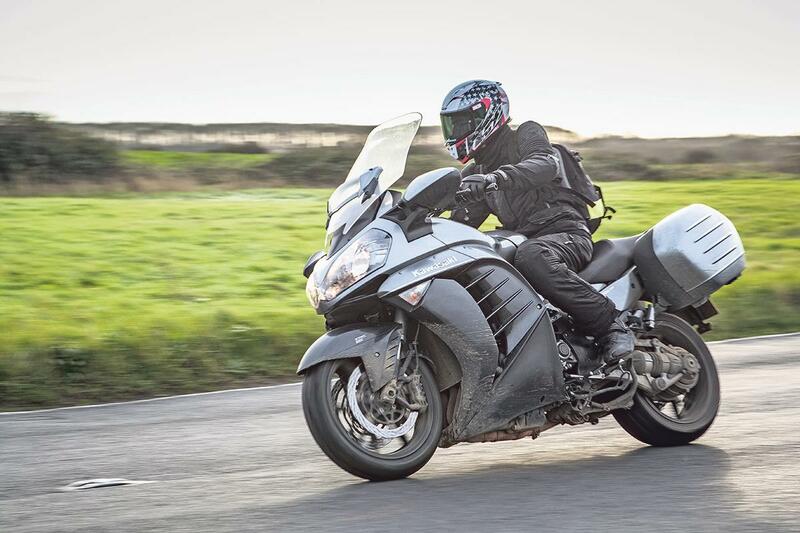 The current Metzeler Z8s (approx £235 a pair mail order) are at the end of their life – the rear is badly squared off, and they’ll soon be replaced with Michelin Pilot Road 4 GT (approx £250). The Metzelers have performed well, giving much better grip in corners than the original Bridgestone BT-021 tyres, although they can feel vague when cornering in the wet. My first winter without a car also coincides with my first without a garage, which means a frosty seat. A heated seat would be a much welcome luxury to get rid of that frost on a morning. Or I could just stop being lazy and scrape it off.